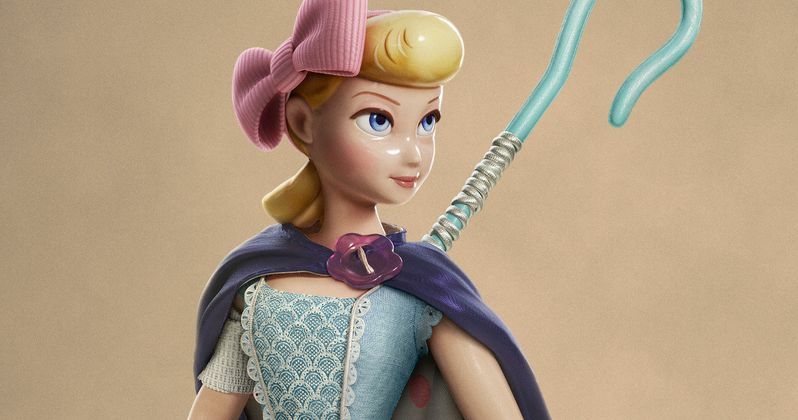 After sitting out the last installment, Bo Peep is back for Toy Story 4. Disney and Pixar have officially revealed that Annie Potts is back with a brief teaser video and a character poster. We've seen some leaked promotional material that showed off the character, but this is our best look yet. In addition to the new teaser and poster, Disney and Pixar have shed a little more light on the highly anticipated sequel and it seems that Bo is back and tougher than ever. Bo Peep is the long-lost friend of Woody, Buzz, and the gang, but she has always shared a special connection with Woody. However, they have not seen each other in years, and Bo has become chipped and faded over time. Bo's strength and sarcasm always belied her delicate porcelain exterior, and it turns out she's an adventure-seeking free spirit who feels right at home on the road. Toy Story 4 will show that she and Woody have reunited under unlikely circumstances and they begin to realize they've grown apart when it comes to life as a toy. It has been teased that the movie will include a love story, but this seems like it won't be that simple. Both Tom Hanks and Tim Allen have praised Toy Story 4, noting how emotional the sequel really is. But both actors never went into details or described where their characters are at this stage in the game. Annie Potts took some time to discuss Bo Peep and says, "She is modern, independent, capable, and confident." Potts went on to say that "Bo is written and conceived to be inspiring as she has weathered life's ups and downs with grace. I aspire to that." Toy Story 4 director Josh Cooley talked about some of the differences between Woody and Bo Peep. He explains. "Bo's taken control of her own destiny. While Woody was watching Andy grow up, Bo gathered dust until she took it upon herself to head out into the world. And when Woody shows up, they can't believe that they've found each other again." In the Toy Story franchise, Woody has always been confident about his place in the world. His priority is taking care of his kid, whether that's Andy or Bonnie. In Toy Story 4, Bonnie brings in her new craft-project-turned-toy Forky, and he quickly declares himself to be "trash" and not a toy, which makes Woody take the time to show Forky why he should embrace being a toy. Things take an unexpected turn when Bonnie takes the whole gang on her family's road trip excursion, and Woody ends up on a detour that includes a reunion with his long-lost friend Bo Peep. Bo Peep has a new attitude about her life as a toy when she and Woody meet up again in Toy Story 4, and things aren't always what they seem. As for how the two are reunited, it has been rumored that a store for old toys may be the place and it just might include Keanu Reeves' new John Wick-style toy allegedly named Duke Kaboom. Things sound like they're going to be pretty different this time around for Woody and the gang. You can watch the brief teaser below, thanks to the Toy Story Facebook page.